Choosing the right toilet for your purposes can be very easy with the right guidelines and particularly disappointing if done incorrectly. This is because toilets are time-consuming to install and to properly utilize, therefore it’s paramount to try and have it correctly done the first time or risk reinstallation costs. There is no further need to explain the importance of owning a good toilet, as any person in the world will spend a significant portion of their time sitting on one. Throughout modern history, toilets have been significantly improved with ever-changing and improving technology, all aimed at giving us more freedom and comfort in using them. There are a lot of options available on the market in terms of proper toilets, that sometimes it can be hard and confusing to pick one that suits you the best. It is also therefore very important to be equipped with the proper knowledge which you can easily glean to end up with a commode that’s simply the best one for you. While buying a great toilet can be sometimes hard due to the number of things to keep in mind, gaining the proper knowledge needed to buy one is very easy, as long as you know what to look for and read. To help with this, here are some things to remember in choosing the best toilet for you. The first thing to worry about when buying a toilet is its size and location. It’s imperative, that whenever you’re making a list of prospective purchases, that all of those options can fit the location of where you’re going to install it. This is one of the biggest rookie mistakes people seem to make when buying a toilet. Most think of the color, the style and the flushing technology first and foremost, and they forget that all of these things are moot if you can’t properly install the toilet in the place it’s supposed to go. Remember to always check the toilet’s dimensions, the height, which is always relative to your needs, the rough-in which can be attributed to its location, and its overall bulk which can add filled space to your bathroom. In most cases, a two-piece toilet, which consists of a separate tank and bowl, is the more common and tried-and-trusted option. They also have the advantage of being relatively less expensive, and they are definitely easier to transport and carry, which is helpful if you’re a do-it-yourselfer and you’re planning to take it up a flight of stairs. One-piece toilets, on the other hand, are easier to clean and maintain due to the absence of nooks and crannies where bacteria can grow from filth. The seamless design is also great for a high-end look which is great for any theme your bathroom has. In spite of these differences, their functions vary from price to price so the choice is largely up to you as you can’t go wrong with either. These choices reflect a more upscale look which can be very pricey to some but definitely worth it to those who can afford it. High-tank toilets take the two-piece look to its extreme, separating the tank to the bowl from a higher stance, giving your bathroom a sort of old-world charm to it. These toilets usually utilize a retro pull-chain mechanism for flushing, adding more to its rustic beauty. In-wall toilets on the other hand work and look differently because they’re inside the wall the toilet is backed on, and is therefore hidden from view. In-wall toilets are slowly gaining in popularity as the look is so minimalistic and can be space-saving, making it perfect for smaller condos that still need that luxurious feel. The option to do this can be a bit more limited though; as you have to ensure that your wall plumbing can accommodate such an arrangement. It’s much more expensive, too, since you have to carve into your wall in order to install it. The flushing mechanism of every toilet can be broken down into two main types: whether it’s assisted by natural gravity or water pressure itself. This area is not just for keeping up appearances, but for maintenance reasons as well. Most modern homes can benefit from push-button flush mechanisms since it looks more modern, in a sense. It also gives your toilet a premium feel to it, and you can never go wrong with that feel. However, lever action toilets are less expensive and will better fit a traditional home, so you cannot go wrong with either. Toilets are not just there for function, but for enhancement of aesthetics as well. Universally, a pure white porcelain toilet is the way to go, as it never goes out of style and there is some resale value to it. However, if you have the means for it, you can go for your existing bathroom theme and pick a color suited to it. Just don’t expect to see some use for it in case you renovate and change the theme of the bathroom. White toilets can also be problematic in such a way that there are various shades of white which differ from toilet to toilet. To keep your bathroom as exquisite as possible, be sure to match the toilet’s white with the overarching white that your bathroom presents. Mismatched whites can lead to assumptions of either an old toilet or an old bathroom. Most toilets available on the market today are within the standard height of about 17”, which is the recognized height for the normal toilet. 17” is one inch lower than the normal chair height, allowing for some squatting which can be helpful in doing about your business. In some cases, some manufacturers produce 19” high commodes, which are deemed as the comfort height toilets. From a purely medical standpoint, lower toilet heights are recommended for most users because of lumbar issues and such. For those who have trouble getting into a squatting position though, such as the elderly or taller people, comfort height toilets are the way to go. After considering all options available at your disposal, it’s time to look at some of the options available for the best toilets in terms of cost-efficiency. Keep in mind that these are not the only options in terms of getting the best toilet, but serve more as a guideline into finding out what to look for in the best toilets there are. With that in mind, here are some of the best toilets on the market today. The Drake line of the esteemed Toto brand is a great choice for a two-piece toilet within the cheaper options. It offers a contemporary high-profile design in two separate pieces: the tank and the bowl. The Toto Drake also benefits from Toto’s very own SanaGloss coating innovation, which gives the ceramic a smoother and clearer surface. This same innovation helps in self-cleaning the toilet with every flush using revolutionary ion barrier glazing technology, giving you less hassle in terms of overall cleaning and maintenance. The Toto Drake also utilizes a fast flush technology within a 3” flush valve that is exceptionally larger the conventional 2” toilet flush valve. The result is a faster flushing mechanism that is supplemented by Toto’s very own G-Max flushing system that offers supremely quieter performance on all fronts. 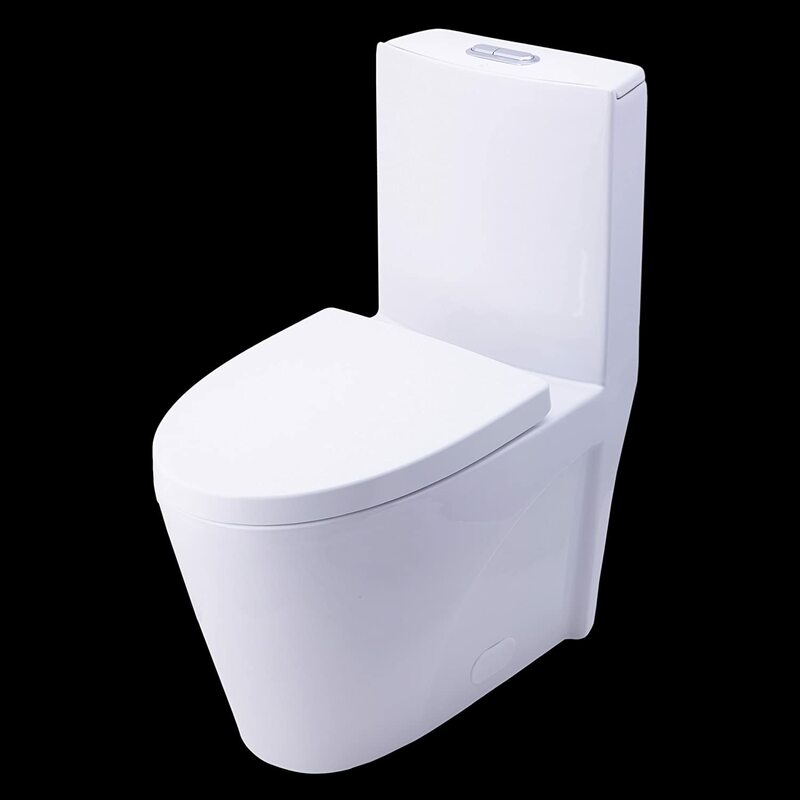 The Toto Drake has a 12” rough-in which is the standard for all toilets, and features a jet flushing action with low water consumption of 1.6 GPF. Some units suffer from bad plumbing sizes which result in clogging problems for those particular units. The good news is that there’s a warranty, so if you run into a problematic unit you can return it within those terms. The Toto Drake’s first iteration is still one of the best two-piece toilets on the market today, despite a newer Drake coming out. It has exceptional cost-efficiency and therefore worth the time considering if it’s within your budget. Kohler’s entry into the cheaper price range of toilets is from the Memoirs lineup, the Memoirs Stately. It’s a two-piece toilet that is made with a high-profile design utilizing the Stately’s clear and crisp lines. The Stately’s bowl is elongated in its design, allowing for more spacing and room to do your business. This particular set of units also benefit from a single-flush gravity model which uses the force of gravity in its precision-engineered bowl, tank and trapway in order to give the toilet an incredibly strong siphoning power during each and every flush. The Memoirs Stately is also retrofitted with the comfort height seating dimension, which is perfect for those seeking more comfort within their toilets. It also utilizes an AquaPiston canister innovation that allows water flow from 360° coverage to flow into the bowl, increasing the effectiveness of all flushes. The high-profile design is prone to get some users wet, particularly males. This is due to the splash-back experienced in a higher drop to the bowl’s center. It would be a good idea to supplement your purchase with an advanced toilet seat in order to raise your bottom higher and avoid getting wet. The Kohler brand is a tried-and-tested one, so with the price and cost efficiency of the Memoirs Stately, you’d hardly go wrong. The comfort height might take some time getting used to, although it is but a hiccup in a toilet that is nearly flawless. Arguably the only really good choice for RV owners, the Dometic 320 series toilet is an incredible marvel of toilet engineering from the brand that’s synonymous with exceptional RV experiences. The Dometic 320 series toilet makes use of an elongated bowl design for full-sized and homelike comfort that is simply unmatched by other RV or camper toilets. It also utilizes a full-sized wood seat which promotes exceptional comfort, which is within the limits of a residential-height toilet. The Dometic 320 series toilet is made with full high glass ceramic, giving it a stain-free smoothness and self-cleaning properties. In almost every way, the Dometic 320 series toilet is easier to maintain than most of its counterparts, as well as having a scratch-free surface to further add to its reliability through longevity. The Dometic 320 series also makes use of an extreme low-flush technology that uses natural gravity assistance for incredibly low water consumption. The stock water valve sold with the Dometic 320 series is reportedly of a low quality which makes it prone to cracks as a result. A replacement water valve might be necessary in more than a number of cases, which adds to some disappointment for the unit. If you’re an RV owner, you will be hard-pressed to find another camper toilet in the same realm as the Dometic 320 series toilet. As it stands today, it’s one of the best toilets in the market for RVs and campers. An overall better choice for a mid-ranged one-piece toilet, the Ultramax II revives the staple Toto Ultramax lineup and revitalizes it with innovations better suited for modern homes. The Ultramax II, like its predecessor, is a one-piece toilet set which promote better maintenance than two-piece toilets. It uses a universal height for most adults’ preferences, giving off comfort at a value worthy of its sufficiently more premium price tag. The Ultramax II utilizes Toto’s innovative CeFiONtect glazing for a powerful ceramic smoothening technology at its very core. This CeFiONtect glazing provides protection from debris sticking to the ceramic sides and surfaces, making them relatively easier to clean and maintain, and lessening the overall hassle associated with toilet care. The Ultramax II also comes with the Tornado Flush flushing system that uses two very powerful nozzles in siphoning off water and reduces overall waste buildup without a high need for water consumption. The said universal setting height is described by some former standard height users to be a bit awkward, especially for taller or shorter people. It’s also described to be subpar in contrast to the former Ultramax model, which made use of a standard seating height instead of the universal one. In spite of the seating adjustments you might have to make, the Toto Ultramax II is one of the best toilets you can get in this price range. Its revolutionary innovations are incredibly well-implemented sitting atop an incredibly aesthetic design, making it a worthy option for those with the budget to support it. Even though it’s not as big as a brand compared to Kohler or even Toto, BAI still delivers on great bathroom fixtures, especially evident with the BAI 1009 toilet. The BAI 1009 is made from high-quality vitreous china ceramic that offers pure white aesthetics in a highly durable form. It also makes use of a dual-flush technology commonplace with higher-end toilets today, with an industry standard of 1.6 GPF. Aside from being a product from lesser known brand, the BAI 1009 is a bit expensive in terms of its relatively new status. You might not want to gamble on an unknown for the price, so keep that in mind if you do decide to shortlist this toilet. All in all, though, most users are happy with the BAI 1009, and this makes it one of the best new toilets out there today. If you don’t care much for branding as much as functionality as it’s documented, you can do no wrong with the BAI 1009.